Tony the Fridge made an appearance on the Chris Evans Breakfast Show on BBC Radio 2 this morning. And since then, I’ve noticed people searching for him and finding my blog. So I’m giving him a bit of a bump. In case you don’t know, Tony is running 30 Great North Runs in 30 days carrying a 40kg fridge on his back to raise money for the Sir Bobby Robson Foundation which funds cancer research. His last one will be on the day of the race – Sunday 16 September. Find out more about his challenge on his charity fundraising page or follow his daily pictures and updates on twitter @tony_the_fridge. I’ve been lucky enough to run part of the route with Tony twice now and will do again before race day. You can read about my experience of running with him on Day 13 and Day 20 of his challenge. He’s doing an amazing thing, so if you can show him your support, I know he appreciates it. Meantime, my own race preparation continues to go well. I did my last training run this morning and caught myself thinking of it as ‘just’ 6 miles. 6 miles is a good distance, it’s just that running much longer training runs now makes it seem relatively short and easy. I’ve also been for a fantastic sports massage, a little treat to myself to make sure my legs are in fine fettle for race day. So the plan now is to rest well, eat well, sleep well and stay well ready to smile on the start line and sprint for the finish. 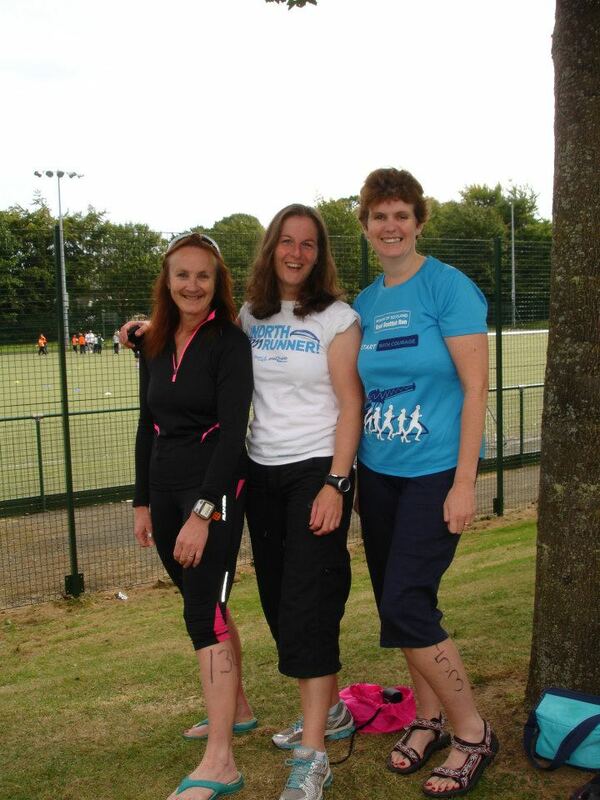 Haddington triathlon was a great way to sign off my multi-sport season. A sunny summer’s day, racing with friends, feeling fit, in form and relaxed. I drove up to North Berwick on Saturday afternoon, enjoying the sight of fields stacked with golden bales beneath the blue skies. A sense that summer is ending, but it’s closing with a golden glow. As always I was made to feel most welcome at Lesley’s home. In many ways it was just like turning up for one of our tri days, only this time we would be racing on her turf. After a lovely afternoon together, we enjoyed a pasta feast and a sensibly early night, waking early to a stunning sunrise over the hills and the welcome sight of the nearby airfield windsock hanging flat. Porridge, banana, faffing and loading the van with our bikes, we were bright and early to register at race HQ and they were still setting up as we arrived. 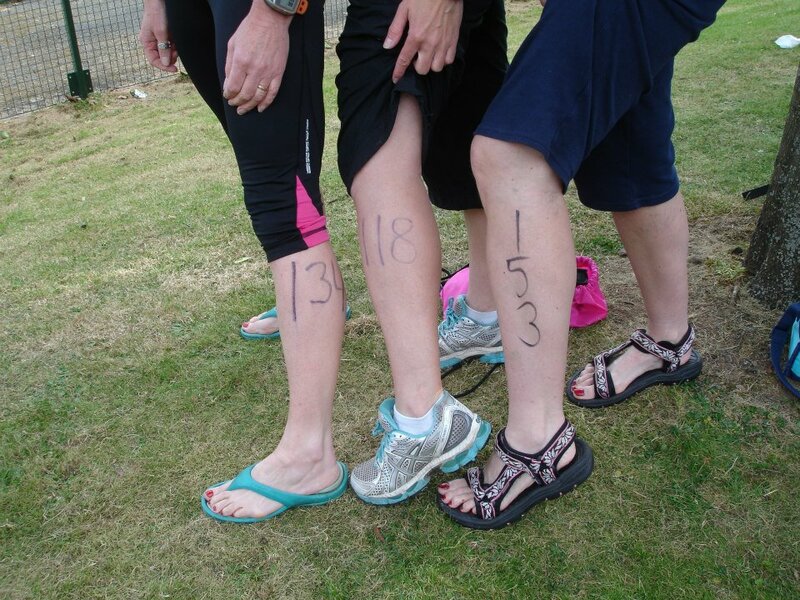 Even when marked up with my race number, 118, I still didn’t feel particularly hyped up or nervous. Lesley seemed to know everyone and there was a constant stream of meeting, greeting and introductions. As we went to rack our bikes outside beneath the trees, we met another Fetchie, Jane. I enjoy reading her cheery blogs, so it was nice to put a face to a name. The transition area looked small, only about 150 people in this race. There were some gleaming bikes and nice kit on show though. And I liked the racking in wooden frames, rather than on scaffolding poles. It was a free for all, so we picked a good couple of slots at the end of row and set out our stuff. An hour soon passed and we gather for the race briefing. We learn that the run course has undergone a last minute change due to the farmers getting the hay in nearby. It will be a little shorter than the advertised 7k, but when asked, the organisers admit, they don’t know how far it will be. We smile and applaud their honesty. Let’s take this one as it comes. Lesley’s son Al arrives to cheer us on and we watch the first wave of swimmers in the pool before getting ourselves ready. Even now, I have to remind myself that I am racing. I take some deep breaths, stretch and roll down to get set for the swim. It’s been two months since my last triathlon and I haven’t swum more than once a week since. I’ve never raced 750m in a pool before and can’t remember what time I’d entered for the swim. I’m astonished to see an optimistic 17:15 on my form and wonder where I plucked that figure from. It puts me in the second swim wave and second to go in my lane. We applaud the last swimmers from the previous wave and then get in the pool. The swim briefing is calm, clear and concise and I have time to do a couple of sinking drills before I start. The whistle goes and I am away, smooth and calm through the water, what a relief! After the first couple of lengths, I feel my heart rate quicken and try to take my time through my strokes. Quite early on, there’s a grab on my ankle and I let the swimmer behind go past at the end of the length. But I have been brushing the toes of the swimmer in front of me too, and on the next length he stops and lets me go ahead. There is a fair bit of order swapping and changing in our lane and it unsettles my rhythm quite a bit. But I convince myself to go with it. To live with the rising bubble of tightness in my chest and the mess that is my head. With only 10 lengths left, I feel like I gain control, but I am unsure of making a bid to overtake the guy in front when I am still taking my time on the turns. At last the float taps me for the final 2 lengths and I give more of a kick. I cannot go full pelt as I am swimming on this guy’s toes. I really do need to work on my pool race skills. I take my time and reset my focus with a leisurely transition, into bike shoes, helmet, sunglasses and number belt, then wheeling my bike out to the mount line and away. I realise when I am off down the road, that I never looked to see if Lesley’s bike was there, presuming she will have beaten me out of the water and be speeding off along the country lanes. I have been reading some tri articles recently that advise easing into the bike and putting the effort into the second part of the ride. In truth, I am not a good enough cyclist for it to make much difference, but I like the sound of this strategy. As a result, I am quickly passed by three or four other riders within the first couple of miles. It never once crosses my mind that I am giving away precious time made on the swim and when I can no longer sense anyone behind me, I convince myself I must now be the last of my wave. My bike is running beautifully. The sun is shining. The fields are green or gold as the horses look up to see me pass by. I have ridden this course with Lesley before and it’s psychologically mainly flat and then downhill all the way after the turn. This is not literally true as there’s a wee climb in the second part of the route, but it works for me as a race plan. I make sure I slurp down some water as it’s getting hot, thank the marshals on the turns and, as I hit a nice spot of smooth and flat, I hit the drops and turn the legs over quickly, enjoying the sensation of speed and lightness. On the next little incline, a girl called Denise rides past me. She was in my swim lane, so I know they haven’t all gone past. With a fast turn over in my legs I try to close down the gap without drafting and target her for an overtake further along the road. Suddenly I’ve found my competitive head on the bike and I’m quite enjoying it. I put on another spurt to catch her, but it doesn’t stick for long as she’s away ahead again. 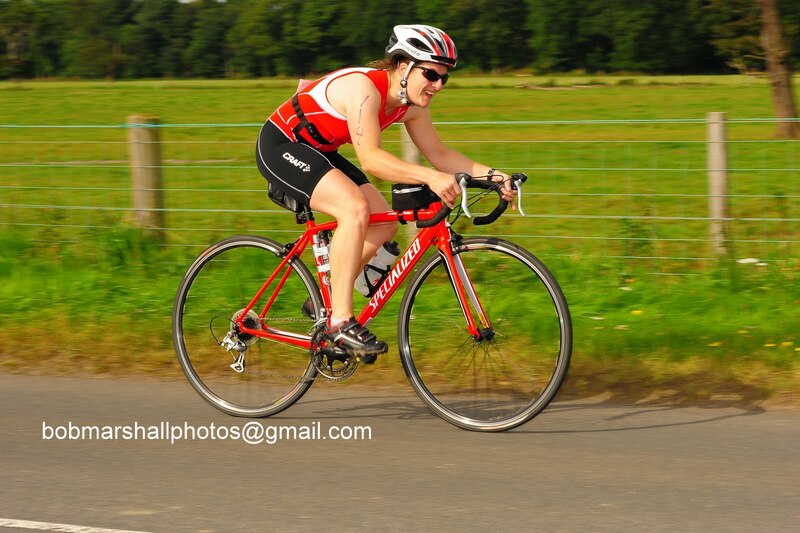 But she’s made me work harder than I usually do on the bike and the finish is fast approaching. A turn into a road marked by speed bumps and pot holes and I begin to spin through the easy gears before cruising up to the dismount line, then off over the grass and back into transition. And suddenly, there’s Lesley racking her bike alongside me. She’s been behind me all this time and just gained on me at the end. I’m shocked and inspired to get a wriggle on and out of transition. Al runs beside me a few paces as I head out from transition, encouraging me on. But I have all the incentive I need, knowing Lesley is behind me. I keep the legs turning over, taking small steps and ignore my rising heart rate, knowing it will settle as I ease into the run. This is the bit that holds no fears. With my recent focus on half marathon training, I know this should be easy. I’m quickly onto pleasant tracks besides the fields. My running shoes feel soft and welcoming on my feet and I manage to ease my breathing and my legs after about 1km. By now the sun is hot and high and I’m glad of the patches of shade as the route takes us through a wooded area. With my fuzzy triathlon head on, I step out to turn onto the road we’ve cycled along at one point and the girls at that point yell loudly ‘ No, along the track!’ They’ve already told me twice and must think I’m stupid. Over a wooden bridge and there are runners passing by in the opposite direction regularly now, shouting encouragement and well dones. I veer between cruising and pushing on, keeping my legs moving, feeling confident in my running form, even in the heat and look ahead trying to spot the turn around point. It comes at a little side path where more young marshals are dishing out cups of water and there’s a huge wooden log which we must touch before turning back the way we came. I pass Lesley on the return leg and tell her it’s not far to the turnaround. This time the little downhill in the woods is a few footsteps of a climb, but really most of the track is flat. As I turn into a gate, the marshal says about ‘a mile and a half to go’. I’m feeling good, strong, and happy to be out enjoying the sunshine. I turn back along the river, looking for landmarks, seeing buildings ahead and sensing that I’m close to the finish. There’s a marshal pointing to a path up from the river and there’s the finish. A quick scramble up the grass, between the tape and over the mat with a sprint. A volunteer takes my chip and as I pause to get my breath back a team of young ladies offer me water, cereal bars and bananas and encourage me to pick up my race souvenir with a choice of a towel or socks. Al and I soon see Lesley run in and we hang around for a while, chatting to the spectators and applauding the finishers, including a guided runner, before heading back into the sports centre for a welcome shower and clean up. Feeling much more refreshed, we catch up with Jane and pose for pictures in between cheering on the fast finishers until the end of the race when we collect our bikes and other gubbins from transition and fill up on brownies and cake. This really is a brilliant race. Well organised, well marshalled and played out on pretty country roads and trails. It’s gone into my top ten and is firmly my favourite pool-based triathlon so far. With the perfect script of ideal weather and a relaxed performance, it couldn’t have gone much better. Great photos from Lesley’s husband Bob will continue to furnish good memories of a great day in future too. 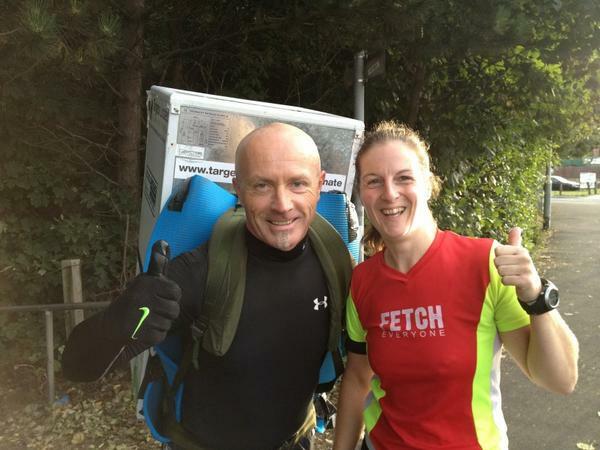 I ran with Tony the Fridge again on Thursday morning. The sun was coming up over the silver curves of the Sage music centre on the banks of the Tyne. As we crossed the bridge beneath the Great North Run banner, we stopped for a photo and Tony tweeted the title of this blog post. Tony was in fine fettle, full of banter. He’s so connected to this place, every corner holds a story, a memory, a person loved and remembered. I drifted along listening to his stories. I didn’t want the run to end. Just four miles, but I learned so much. I am building my own memories of this place, this region that has notched itself into my heart, but I’ll never have that depth of connection to the big river. It made me reflective but joyful all day. I have, in my inevitable way, lined up a string of treats and excitements, days so full of promise that I’m afraid I might burst looking forward to them all. On Tuesday I took a day off for a long run and indulged myself by running it over much of the Great North Run route. It was a glorious running day, with sunshine, a slight breeze and a lightness in my mind that pleased me. I had my music to help me keep tempo and pace, but much of the time I turned it off. Jeff passed me in his car and stopped to give me a shout as I just started off. I caught him again later on and as always, he was full of encouragement. He said I was looking good, running well, and I knew it was true. I ran most of the 11 miles easy and light, feeling well within myself, apart from a sticky fretful mental patch about 8 miles, but even that didn’t take too much wrestling. With a 10 miler behind me on Sunday I’d given myself permission to ease off if I needed to in the last mile. And as I turned onto the Leas at South Shields I was hit by a head wind and decided not to fight it. I slowed my pace and cruised down to finish the set, a useful reminder that I will need mental focus to keep me going in the race, as once I stepped down, I could not find the pace to step back up again. 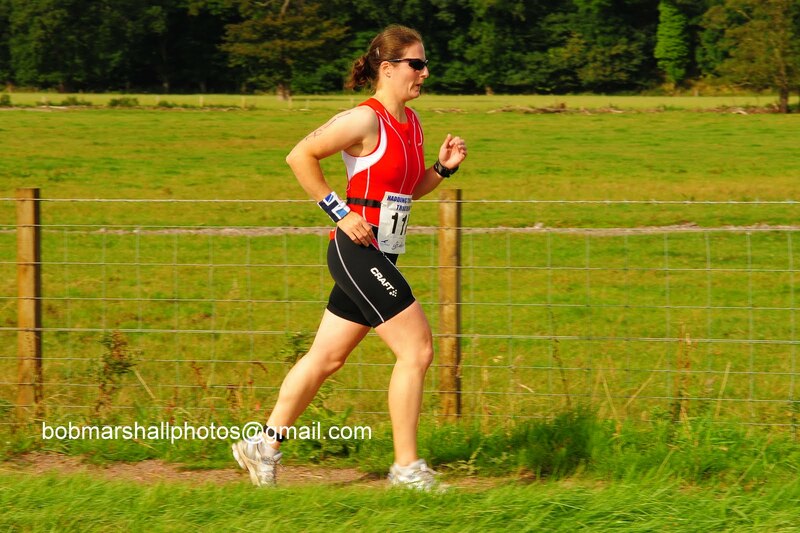 This weekend I go to race my last triathlon of the season with my fabulous friend Lesley. I’m surprisingly relaxed about it, even though it’s two months since my last tri. The race is almost irrelevant other than the excuse it gives me to spend time with my friends. I feel like I ought to be taking it more seriously. I know I will enjoy it whatever the result. We always have the best time together. Then there’s the big run, which has, despite all my efforts and protestations, become the big run again. I feel that it’s all coming together just in time for me to give the Great North Run another good blast. And that it will mark season’s end for me. But it’s not just about me. I’ll be just as excited for other friends doing it for the first time, in search of a time or just for the experience of being there. I’ll no doubt be as keen to catch up with them at the end as I will be to review my own progress. There are some this year who I will miss, but they’ll be on my mind too as I run and enjoy the day. And after all that, I’ll get the chance to take a bit of a break, kick back, explore some new horizons and not worry too much about miles on the road, on the bike or in the pool. My amazing summer still holds much promise. You can find out more about Tony the Fridge and his 30 Great North Runs challenge on twitter @tony_the_fridge, on facebook, or his charity fundraising page. 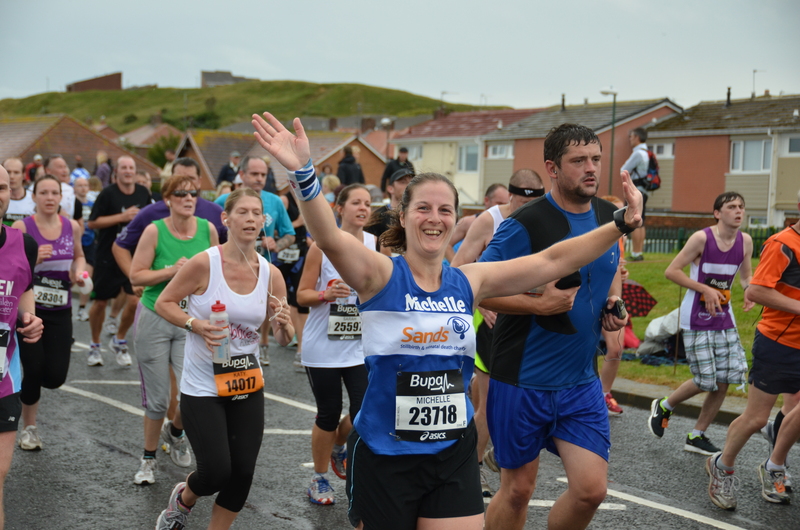 Great North Run – who are you running for? 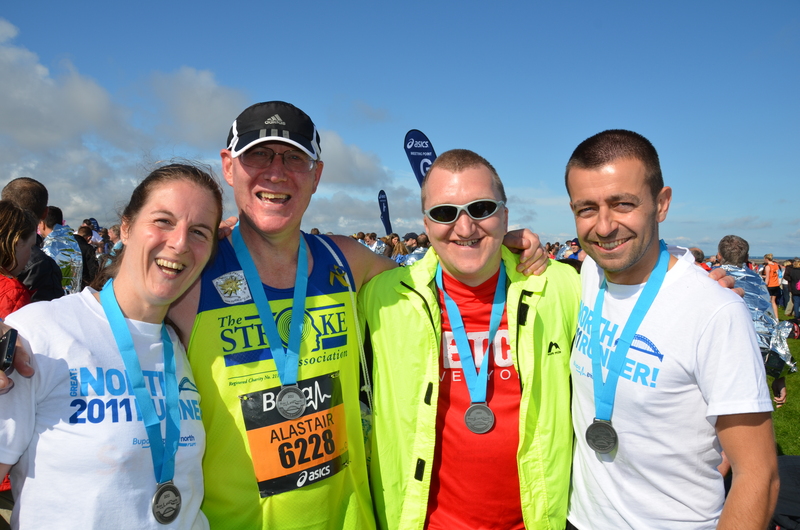 One of the things I like most about the Great North Run is that everyone has a story to tell. About training mishaps; about injuries; about slogging it out on those long runs; about what it was like to run it way back when… and most of all they have a story to tell about why they are doing it. I have a long relationship with this race, that goes back much further than my running career. When I worked as a journalist, the date was etched on my mind, as one of our biggest outside broadcast events of the year. And many times I stood on the central motorway microphone or camera in my hand, listening to the stories. It was always a long and tiring day, but it never felt like hard work. It was a privilege to hear the stories. Many a time, they made me cry. People run in memory of their mother, father, grandpa, son, daughter, auntie, friend, work colleague. They remember those who are no longer around to see the sweat and blisters, the tears and triumph of the run. The runners celebrate triumph over illness, disability or just the bad luck that the world throws at good people. They raise money in their thousands, to fund medical equipment and research; to bring a bit of relief to people who are in pain; to take water to the dry places; to train guide dog puppies, or help animals in distress. To do things that make life a little easier for those that need it. I’ve already introduced you to Tony the Fridge who has added the extra burden of a 40kg fridge and a 30 day consecutive run to his fundraising efforts for the Sir Bobby Robson Foundation. I hope he finishes his 30th run in as good spirits as he’s seemed to take on this challenge. Then there’s Mark Allison, better known as Run Geordie Run, who is running across Death Valley in America before leading a team of runners taking part in the mini, junior and Great North Run to raise funds for the Children’s Foundation. I’ve also been in touch with Frankie Aitchison, who is supporting the same charity as I am. Frankie’s daughter, Ella was stillborn. So to mark what would have been her second birthday and raise money for Sands, the neonatal and stillbirth charity, Frankie is taking on the equivalent of a half ironman triathlon over the Great North Run weekend. 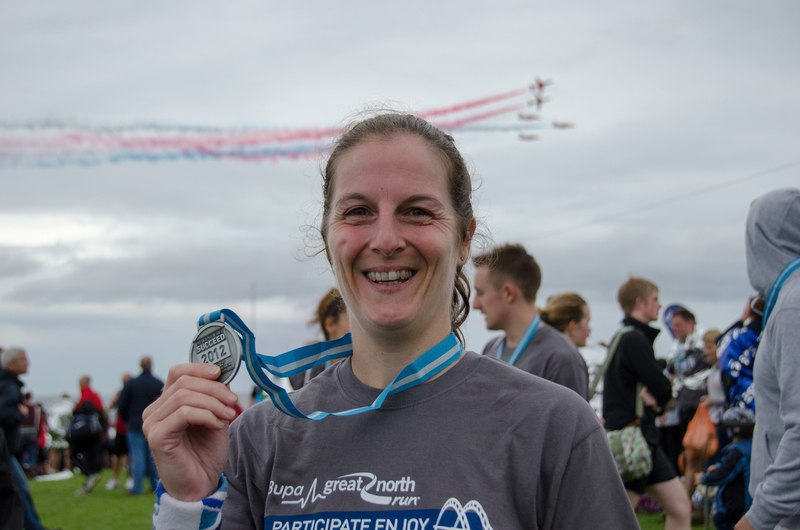 On 14 September she will swim a mile; the next day, she’ll cycle 56 miles and then on Sunday 16 September she will run 13.1 miles on the Great North Run. These are just three amazing people with inspirational stories of courage, endurance, bravery and heart taking part in this iconic race. But you have your chance to tell your story too and feature your charity. Sky Tyne and Wear wants to hear your stories of who you are running for and why. It will feature these in a special gallery on its website, along with your Just Giving link to give your charity a plug too. You need to submit a photo and a few words about why you’re running and you could also be in with a chance of winning an all inclusive membership package at David Lloyd gym in Newcastle. Now Sky got in touch to tell me about this competition. But they’re not offering me anything in return for telling you about it. I just thought it was a good idea, and it could help you get some publicity and boost your fundraising for your charity. So, if you’re interested, go to sky.com/tyneandwear, click on the “I’m Running For…” section and follow the simple instructions or email a picture or video to tyneandwear@bskyb.com and put “I’m Running For…” in the subject line. The competition is open until Monday 17 September 2012. And if you’re not, I hope you’ve still been inspired by some of the runners’ stories I featured here. Like Frankie, I’m also raising funds and awareness for Sands. I do that in memory of my baby sister Ava and I’ve found it’s been a great way to bring something positive out of a very sad time for my family. I have wonderful support in this, particularly from some very special friends, but also from people I’ve never met who have found out about my fundraising through doing the run. It really means a lot to me to get a donation or an encouraging word of support. It’s like having my own crowd cheering me on and it certainly helps me if I find part of the race tough, to think of everyone who has got behind me and my charity. Author The ScribblerPosted on 3 September 2012 Categories runTags charity fundraising, Frankie Aitchison, Great North Run, mark allison, run geordie run, running stories, Sands, Sir Bobby Robson foundation, Sky Tyne and Wear, stillbirth, the children's foundation, tony the fridgeLeave a comment on Great North Run – who are you running for? This race, a traditional warm up for the Great North Run, goes from Hexham to Ovingham along country roads, through the village of Corbridge in the Tyne Valley. It’s really popular with local club runner and about 500 people take part in it. It’s well organised, marshalled and they serve you jelly, a sandwich and a cup of tea at the end. I think more races should serve jelly at the finish, it’s a great recovery food. Anyway, this was to be my second time running this race. Like last year I was using it as a guide to my pace for the Great North Run, the main difference this year being that I wasn’t sure what that pace was. I’ve had a couple of good runs recently where I’ve been able to do a few 9 min miles, so I wanted to see if I could make that stick over a longer distance. I’d said I’d pace Tove, my friend from parkrun, who won’t believe that she’s actually a good bit faster than me on her day. This gave me a whole new level of responsibility and a great incentive to keep digging in and keep the pace up. Anyway, I wish I had gone back and read it as I remembered very little about the race other than the fact that I did well and enjoyed it last year. This year was pretty much a repeat performance. We walked down from the leisure centre, over the bridge and along a country lane. We only just joined the back of the pack when the hooter went off and the race started. I reckon it took about 20 seconds for me to cross the line and get away. It’s not a crowded start, as the roads are wide enough to manage all the runners and I soon slipped into an easy pace, focusing on keeping my stride short and turning my legs over quickly. I was conscious of not setting off too quickly and trying to keep a moderate pace. It was perhaps a little too sedate as Tove and I had agreed on 9:15 and we went through the first mile on 9:26. I picked it up a bit for the second mile and here I felt I really settled into the run, trotting out the miles feeling very comfortable in my breathing and steady with my feet. We went through the next couple at close to 9 minute miles. It was warm and sunny again, which made us stick to the side of the roads in search of shade and weave across the tarmac to be in the tree line. The route is quite rural and under blue skies in the sunshine, it’s a lovely run. I’m afraid we slowed down some of the cyclists also enjoying a great day out, but most were cheerful and encouraging as they freewheeled their way through the field. The first point of notice came as we went through Corbridge, where people and a very cute dog watched us run by from the village pub. As you leave the village there’s a long incline where we overtook a Sunderland Stroller and Tove used her long legs to push on ahead. I was expecting this as she’s much faster up the hills than I am. I was also trying to focus on keeping the effort easy and not trying to power up the hill only to emerge breathless at the top. It was a good strategy. There’s a steady climb around the 4-5 mile mark, but there’s a nice bit of downhill to counterbalance it soon after. Lengthening out my stride and just letting my legs go long, I caught back up to Tove soon after a downhill and we were back running together again. The inclines and my conservative uphill strategy cost us some time here, but we were back to a fast couple of miles again soon after and mile 6 was my fastest of the race. I’ve been running with music recently, picking tunes with a good BPM to try and get me to pick up my pace a bit more. It’s been particularly noticeable that when Eminem’s ‘Lose Yourself’ comes on the playlist, I run to its driving beat and clock around a 9 min mile. So today I was using it to try and pace myself, thinking the words and the rhythm in my head. It’s quite hard to do and I tend to get the words jumbled or repeat the same bits in my mind, but it definitely helps. As we were passing another runner called Hillary, I said ‘d been using it to pace myself and she mentioned that Jessie J’s ‘Price Tag’ is another one with a 9 min mile beat. Well, we’ve sung that with choir, so I belted out a breathless half chorus and used that on my mental jukebox for a while. I’d been pretty confident about doing 5 miles at about 9 min mile pace as I’d managed that at the Tyne Bridge Harriers race, but beyond that I didn’t know how long I would last. Tove was sticking with me and I felt good and strong, with the same easy breathing as at the start, so I just kept going, focusing on the short strides and trying to say relaxed. I was happy I’d got to 5 miles at around target pace, and mentally decided if I could take it to 7, then I’d have done a decent pacing job. Mile six clicked over into 7 nicely and then Tove said she was finding it hard. I was conscious that, apart from the hills, I’d been closer to 9 min miles than 9:15, but that was the speed my legs seemed to stick to. It doesn’t sound a lot, 15 seconds a mile, but it can be a big pace difference over a longer race. But soon after that she passed in front of me, so I figured she got a second wind. I had some mango at this point as I could feel I was beginning to tire a little, especially in the heat and I was grateful for a mouthful of water and a splash on my face as we ran through the water stations. By mile 8, Tove had fallen behind a bit and I just kept pressing forward in the hope she could see me and use me as a target. I was feeling the distance by now too, with my calves starting to stiffen and a couple of times I felt myself run off balance, so I knew my form was beginning to tire too. But in my head I knew it was just 2 miles to go. That’s less than a parkrun and just about 18 more minutes to enjoy running in the sunshine in the countryside. For a second I felt like easing back, but I told myself I’d regret it with just two miles to go. I could stand a little discomfort if I needed to. My breathing was steady and everything was in good order, so there was really no excuse not to press on. The thing that everyone mentions about this race is ‘the hill’. It’s at 9 miles, which is a bit of a shocker in a 10 mile race. opinions differ. It’s one to be walked, one to be powered up, or one just not to think about, depending on who you ask. Although steep, it is relatively short, despite a bit of a false summit and a turn. Last year I tried to power up it and left myself breathless at the top. This time I shortened my stride to baby steps, used my cycling experience to determine that the middle of the road was likely to be a bit less steep than the sides and managed to pass a couple of runners on the way up. My pace was barely above walking, but it was a matter of pride to run the whole lot and I was happy to emerge at the top without feeling I was going to collapse. Now you know there’s less than a mile to go and there’s a bit of downhill to pick up some speed. My legs were really tiring by now, but I took one last bite of mango and struck out for home. There were people out supporting their club runners on the final straight and I took a bit of their encouragement for myself. It’s not easy to judge where the finish is, but being funnelled onto a narrow path over the grass and towards the school, I picked up some last gasp speed and powered on to overtake a Wallsend Harrier girl and sprint down the finish line. I’d barely got my thoughts together and hadn’t got my breath back enough to get a drink of water when I saw Tove cross the line, so she really hadn’t fallen very far behind. Your reward for this race isn’t a medal or a T-shirt, instead Tynedale Harriers do a fine job of feeding you in the school at the finish, with a spread of jelly, sandwiches tea and cake. I think it’s a great idea and the jelly in particular is a fine post race treat. It’s cold and sweet and easy to eat. I don’t know why it isn’t a regular feature at more races. I really enjoyed this race. It’s well organised, marshalled and attended – although it does tend to attract more club runners than the more casual running crew. As a result, it’s pretty fast, with the last finisher this year coming in under two hours. My own time was a good bit slower than last year, but I’m not unhappy with that. I was in brilliant form in 2011 and had the advantage of a pacer for the second part of the race who slyly pushed me on to go sub 1h30. This year’s stats show that I was slower every mile, but that I’m faster than I have been for much of the year. So it’s all coming good in time for the Great North Run in two weeks’ time.